Some of the most admired and immaculately designed vehicles across the globe are from the marvelous stables of Jaguar Cars Limited. The company is prevalent in the Indian car market since many years and by now has a fleet of magnificent and enchanting vehicles in the country. They have a stunning premium petrol sedan, which is called as the Jaguar XF 5.0 Litre V8 Petrol and has a power packed engine that gives an incredible performance along with magnificent exteriors. This Jaguar XF 5.0 Litre V8 Petrol sedan is being brought into the country through the completely built unit (CBU) route. To begin with this premium petrol sedan is being offered in petrol as well as a diesel engine based option. But the petrol engine is extremely powerful and has eight cylinders. This 5.0-litre petrol drive train has been equipped with a highly developed direct injection fuel supply system and it also generates awe-inspiring torque and power yield as well to give outstanding acceleration and pick up. Some of the most impressive and practical comfort features in this petrol sedan include a influential air conditioner with heater that has an automatic climate control, central locking for added protection, a top of the line music system with speakers and input options such as a USB port and an Aux-in along with a remote control, a multi functional power steering with mounted controls for more convenience to the driver, all power windows with driver side window getting a one touch up and down function along with an anti pinch feature, steering adjustment in accordance with the requirement of the driver, electrically adjustable driver seat for enhanced comfort and a host of such exciting features. The exteriors of this Jaguar XF 5.0 Litre V8 Petrol sedan are stunning with a spick and span frontage that has a neatly carved out front grille, which is flanked with a radiant head light cluster. These head lights are powered with Xenon headlamps with LED Daytime Running Lights that has automatic leveling. The radiator grille has some chrome elements as well along with a prominent insignia of the company embedded on it. The front body colored bumper has been fitted with a couple of bright fog lamps to enhance the visibility of the driver in adverse conditions. The side profile is smooth and lustrous and has large wheel arches, which house an exclusive set of unique 18 inch light alloy wheels that are covered with robust tubeless radial tyres of size 245/45 R18. The body colored outside rear view mirrors has been incorporated with side turn blinkers, while the body colored door handles are aptly placed with a stylish design. The rear end has an advanced LED light guide technology that gives out a distinct night time signature for this Jaguar XF 5.0 Litre V8 Petrol. 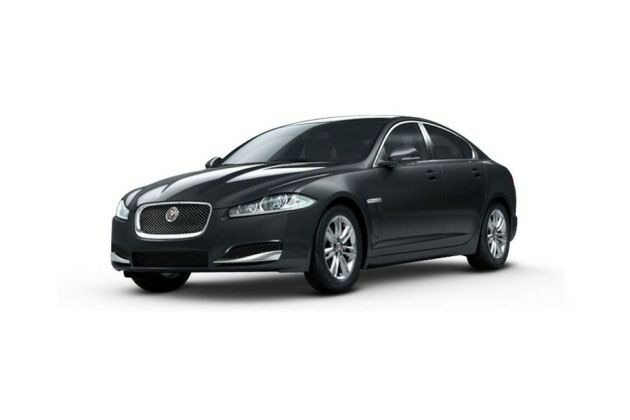 The overall dimensions of this Jaguar XF 5.0 Litre V8 Petrol sedan are quite roomy and can easily accommodate five passengers without any difficulty. The total length of this sedan is 4961mm along with an overall width of 2053mm. Then the total height of this sedan is about 1460mm along with a spacious wheel base of 2752mm. The minimum ground clearance of this sedan is 100mm and it also has an approximate gross weight of 2285 Kgs , which is rather colossal. The interiors of this Jaguar XF 5.0 Litre V8 Petrol sedan are scintillating with arresting Halo Illumination, which makes this car look urbane and sophisticated. The seating arrangement is extremely comfortable and the seats are covered with premium quality leather upholstery. The instrument panel is brilliant and has neatly done up meters along with quite a number of notification and warning lamps, which help the driver with all the vital statistics of this petrol sedan. There is also a seven inch multimedia display in this Jaguar XF 5.0 Litre V8 Petrol sedan, which makes it look up market and impressive. There are quite a few storage spaces as well in this premium petrol sedan such as a large and roomy glove box that can accommodate quite a few things, cup holders, map pockets, storage space in the doors and behind the front seats, bottle holders, vanity mirror in the sun visors and many more such practical and utility based features. The rear seat is foldable and can increase the boot space, which will help in taking in quite a few things as well. The company has fitted this sedan with a power packed 5.0-litre V8 petrol engine , which has been equipped with a highly developed direct injection fuel supply system and also has eight cylinders that are further bestowed with four valves per cylinder. This commanding engine has the capacity to displace a whopping 5000cc and has the ability to churn out 379.70bhp at 6500rpm in combination with a pounding torque output of 515Nm at 3500rpm. This influential engine is cleverly mated with a six speed automatic transmission gear box. This powerful petrol engine can propel this Jaguar XF 5.0 Litre V8 Petrol from 0 – 100 Kmph in just about 5.7 seconds , while the top speed of this elegant petrol sedan is a limited 250 Kmph. The company claims that this Jaguar XF 5.0 Litre V8 Petrol sedan has the capacity to generate a mileage in the range of 5.7 to 12.0 Kmpl, which is quite reasonable for a luxury sedan of this high value. The braking system of this Jaguar XF 5.0 Litre V8 Petrol sedan is very proficient and is equipped with the Jaguar High Performance Braking System with an electric parking brake as well. The front as well as the rear wheel has been fitted with robust disc brakes that give this luxury sedan a proper grip and braking efficiency on any landscape. Apart from this efficient braking system, the company has also bestowed this Jaguar XF 5.0 Litre V8 Petrol sedan with an advanced anti lock braking system that augments the braking proficiency of this premium sedan. The suspension system on the other hand is top of the line with several features like Adaptive Dynamics system, which constantly checks the suspension. Apart from this impressive feature this Jaguar XF 5.0 Litre V8 Petrol sedan also has a traction control as well to further boost the stability of this vehicle and make the drive most pleasurable and exceptionally effortless. The list of features that have been integrated in this petrol sedan include a influential air conditioner with heater that has an automatic climate control, central locking for added protection, a top of the line music system with speakers and input options such as a USB port and an Aux-in along with a remote control , a multi functional power steering with mounted controls for more convenience to the driver, all power windows with driver side window getting a one touch up and down function along with an anti pinch feature, steering adjustment in accordance with the requirement of the driver, electrically adjustable driver seat for enhanced comfort and a host of such exciting features a remote trunk as well as a fuel lid opener, a low fuel warning light, an accessory power outlet for charging gadgets, a trunk light to make it easier for the owners to keep and remove things from the boot compartment, a rear reading lamp for the passengers, rear seat headrests and also a rear seat centre arm rest as well. The company has fitted this Jaguar XF 5.0 Litre V8 Petrol sedan with quite a number of incredible safety features as well. The list comprises of an ABS (anti lock braking system), driver and passenger airbags for enhanced protection of the passengers in case of a crash, a highly sophisticated engine immobilizer to avoid any unauthorized entry, traction control, child safety locks for the rear doors, a seat belt warning lamp and a door ajar notification lamp in the instrument cluster, front and side impact beams for enhanced protection of the vehicle from minor damage, traction control, front adjustable seats that give incredible comfort, keyless entry for added security, a tyre pressure monitor along with a vehicle stability control system and also a crash sensor with an engine check warning lamp integrated in the instrument cluster. Pros: Stunning exteriors, interiors loaded with sophisticated features, powerful petrol engine. Cons: Mileage can be improved, high cost of ownership.